Credit for the swift unification of Japan following the 1868 overthrow of the Tokugawa shogunate is usually given to the national leaders who instigated the coup and formed the new Meiji government. But is brilliant leadership at the top sufficient to explain how regional separatist tendencies and loyalties to the old lords were overcome in the formation of a nationally unified state? On the contrary, argues James C. Baxter. Though plans were drawn up by policy makers in Tokyo, the efforts of citizens all over the country were required to implement these plans and create a sense of national identity among local populations. 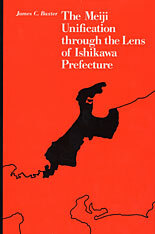 Drawing on extensive archival resources, Baxter describes the transformation of the Tokugawa domain of Kaga into the Meiji prefecture of Ishikawa. The result is a richly detailed study that helps explain how Japan achieved national unity without the bloody struggles that have often accompanied modernization and nation-building.